If you’ve been following the controversy around eggs lately, you know that most egg consumers want to choose eggs that do not cause undue suffering for the hens. The labels are confusing: organic, vegetarian-fed, cage-free, pasture-raised and more. Conventionally-raised eggs are from hens that are confined in battery cages with less than the space of a piece of paper. 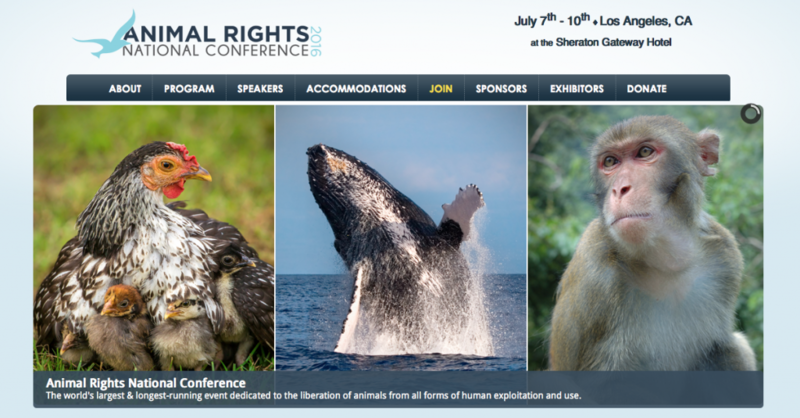 It gets overwhelming to make sense of what these humane labels actually mean. For example, cage-free sounds good, but having all the chickens confined in an airless room can actually create a more unhealthy environment for the animals and the people. And cage-free doesn’t mean they actually are able to go outside. In addition to all of these labels, there are other issues to consider, and the reason that I don’t eat eggs. The best option if you want to eat chicken eggs, would be to get them from backyard chickens, buy them at a Farmer’s Market, or a local farm. Even if it costs more, you can actually use less, by eating them sparingly. 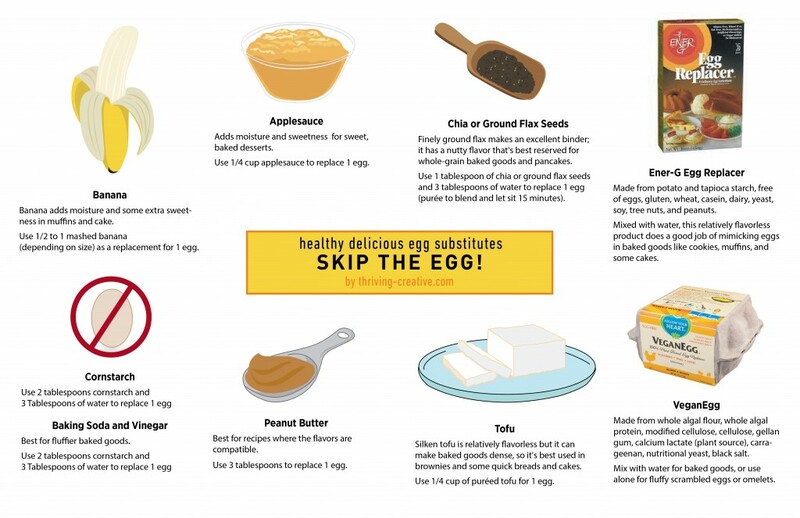 One way to use less is to replace eggs whenever possible in recipes. Eggs are often used just for binding or creating a fluffy texture. I’ve grown to prefer my tofu scrambles, and other egg-free recipes. Here is a chart I illustrated using some substitution ideas. Please share your favorite egg-free dish with us! I make this tofu egg sandwich every week, with vegan mayo, spinach and tomato on toast— I actually prefer it to chicken eggs. Yes, I could photoshop the ostrich popping out of my head, but it was just too funny. Colleen Patrick-Goudreau holds a special place in my heart. One reason is because I used her book, The 30 Day Vegan Challenge in March 2012 to start my own journey. It was helpful, practical, and positive. Her tagline is “Don’t do nothing because you can’t do everything. Do something. Anything.” Her message is about compassion, and people choosing to align their actions to their own beliefs, not hers. I’ve met CPG before, at Portland Veg Fest last year. I listened to her talks there and became even more of a fan. She is clearly very intelligent, funny, and has an almost therapist approach at times. I love her message, I love that she is such a positive and beautiful role model. When I met her, I talked to her about how I felt about the word “vegan”, and she gave me some helpful insight around that, and actually remembered me. I had hoped to go to her 1st summit that happened last Memorial Day weekend, but there is only so much California Dreamin’ I can do within a couple of months! I did end up sharing a room with a new friend who went, and it sounded like an amazing experience. Hopefully I can make it happen next time. I recommend listening to her podcast “Food for Thought” here, and check out her website to get more information and resources. I’m waiting for AR2016 to post their videos of her newer talks there. 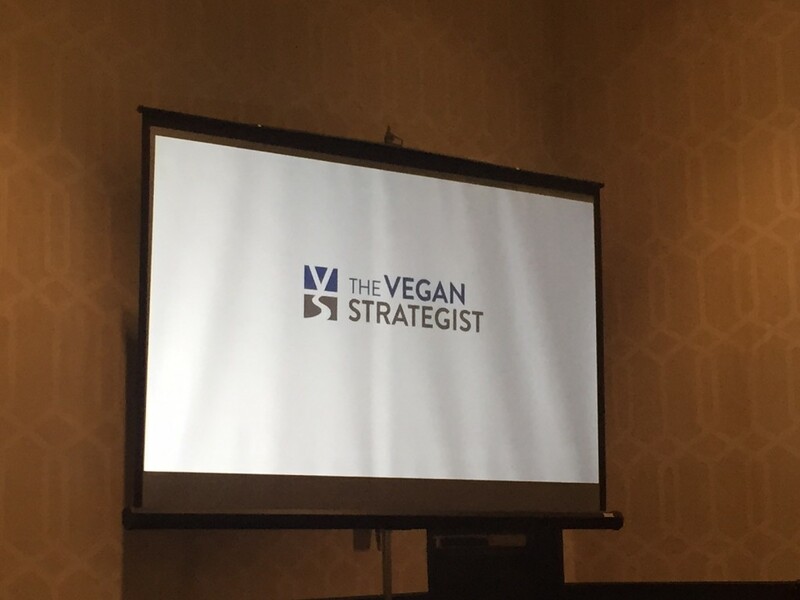 At this conference, I attended her “10 Habits of Effective Vegans” session. I loved her delivery, it was quick-paced and concise. She makes her points logically, and gives clear tips about how to be effective. I would love to link to her video, which should be posted soon on the AR conference website. I wasn’t able to go to her second talk on a panel called “The Power of Language”, but I have heard her speak to this at Veg Fest. In the Portland talk she discussed how calling plant-based meats “fake meats” can be detrimental. That instead of milk being the default name to describe dairy milk, it can be designated as cow’s milk which makes almond milk, soy milk, and other milks on the same plane. Rather than being the lesser “faux” option, plant proteins are a healthy, normal option. I’ve seen the plant-based meats called clean protein, which I agree sounds much more appealing. Colleen also discussed in Portland how the idioms we use continues to reinforce negative images around animals. “Killing two birds with one stone” for example, could be changed to “Cutting two carrots with one knife”. It sounds funny or maybe not the top priority, but it makes sense how the ideas around animals are part of our culture and language. I was impressed at how much research she had done around this, and it is clearly a fascinating topic for her. I believe she is writing a book around this subject. In any case, it has made an impression to the point where I am more conscious about language. 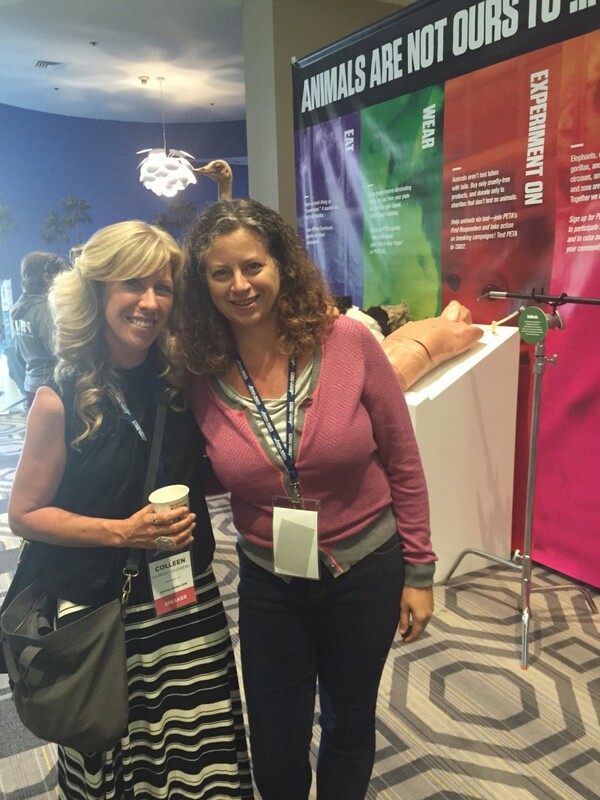 On the final day of the conference, I attended her joint session with Dr. Melanie Joy called “Advice on Vegan Lifestyle”. I really enjoyed seeing the relationship these two women have forged over time. They may cover different aspects, but they seem to share a very similar philosophy. It was entertaining and informative. There was so much great energy and hope in the room. It is a breath of fresh air to focus on effective positive changes and inclusiveness; not blame or focusing on differences. I’m very inspired from these sessions. Thank you Colleen for being such a smart, strong, joyful voice in the movement. One big highlight of this conference was being able to meet Tobias Leenaert in person. We’ve corresponded by email and Facebook from his home in Belgium and mine in the U.S. for about a year. Through my design firm, we worked on his identity and some presentation/book illustrations that have not yet been finished. 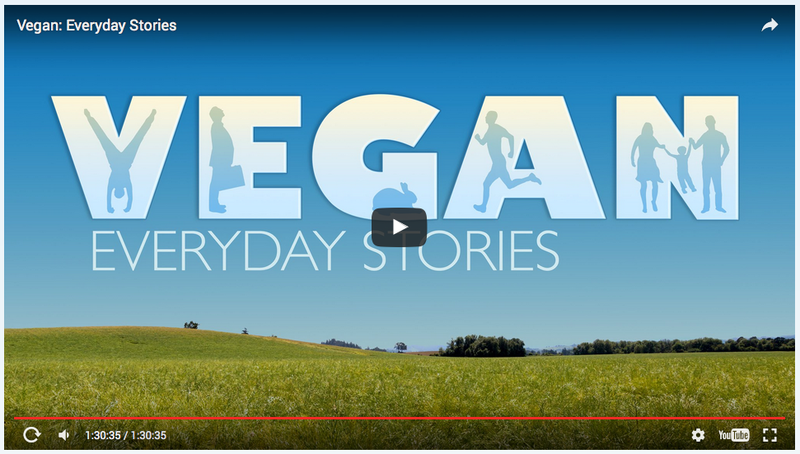 When I discovered his blog, The Vegan Strategist, it was like a breath of fresh air for me. I had been struggling with the dogmatic ideas I had about veganism, and some abolitionists in the movement. I felt like I didn’t fit in, and that my ideas weren’t accepted. 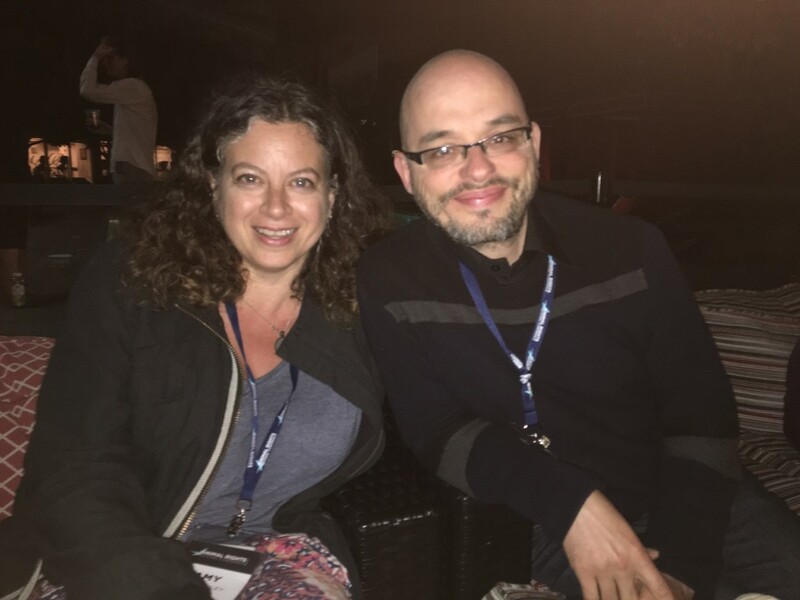 Through Tobias’ blog, I met many other similarly-minded groups and individuals: Vincent Berraud of The Animalist blog, The Reducetarian, Melanie Joy’s Carnism website, the consultancy he and Melanie have formed called Center for Effective Vegan Advocacy, and Friendly and Pragmatic Vegans on Facebook. In person, Tobias was just as he is online, more of a listener than a talker with a dry sense of humor. I attended a few of his talks, mostly panel discussions. He presents his ideas as open for discussion, but has clearly thought everything through evident in his responses to the audience questions. He is working on a book that I was fortunate enough to read an early draft. This is a book that needs to be written, and to be read by vegan advocates and activists. “Practice slow opinion” is his tagline. If our goal is to make change, than being effective is more important than being right. I actually saw this in practice one evening as I listened to a direct activist actively try to change the mind of a non-vegan. The non-vegan had plenty of time and opportunity to learn about veganism and was not opposed to the ideas. He just felt differently about animals than the vegan activist. The vegan activist was speaking very loudly, and asking rapid-fire questions that weren’t questions (“would you kill babies?!”). It was intense and included physical pointing along with the verbal pointed questions. I felt stressed myself just as a spectator. In the end, the non-vegan was playing a game of defense the entire time. It stayed in a respectful zone, but definitely didn’t create any change in either of their minds. I would encourage you to watch Tobias’ video “Making compassion easier”. I hope very much to meet up again one day, hopefully bringing him to Portland. 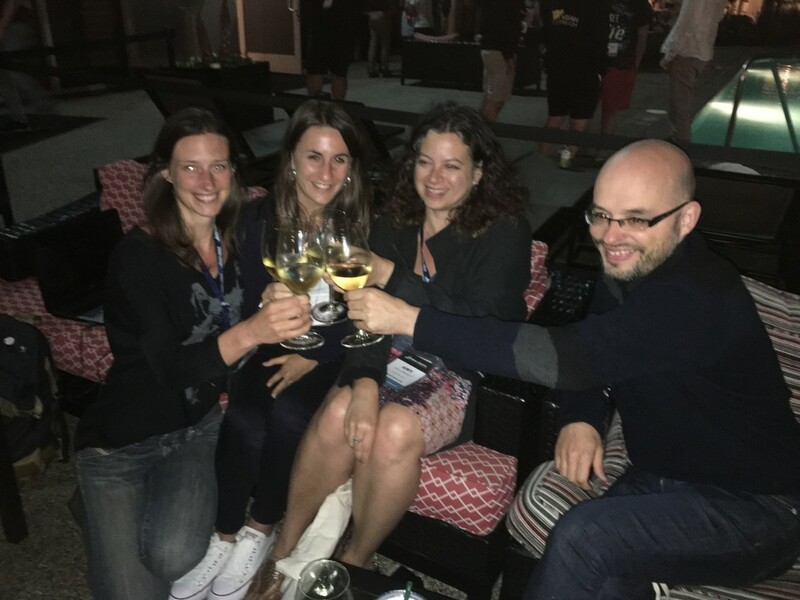 It was great meeting his wonderful partner Melanie, and colleague Carolina as well during this conference! 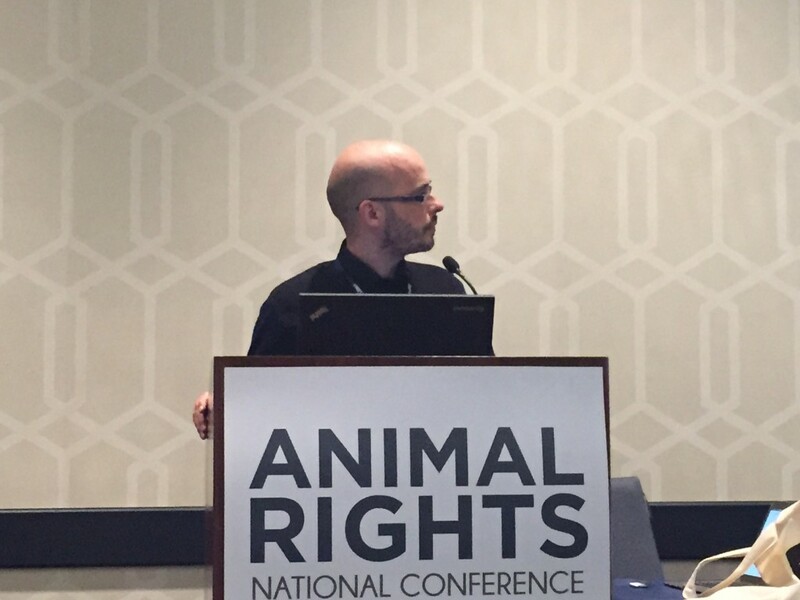 Last weekend I attended AR2016, the largest and longest-running animal rights gathering. I wasn’t sure if I should attend, or what to expect. Since in addition to the horrible plight of animals, we cover a lot of environmental issues and incremental steps, I was worried that this might feel too extreme. I was happily surprised to find a very wide and diverse group of people and organizations there. At times the fact that we all are very different in the way we are advocates and activists for the animals resulted in tension in the group. But never anything too harsh, in my opinion. In fact, even with the people I disagree with (as far as their methods), I was able to see their viewpoint and understand them better. I came away from the conference feeling that although there is no way we are all going to form a completely united group, even with our common goals, everyone is doing what they can from their own angle and their focus. Whether it is freeing monkeys from laboratories, focusing on wild horses, or creating alternatives to meat from animals this is the most passionate group of people I have ever met. And every one is committed to their goal: speaking out for the animals. I believe there are many reasons why anyone can change their lifestyle: from caring for animals, to health concerns, to lessening environmental impact. Once you are able to understand the idea that we do not need animal products to be healthy and happy, a greater awareness can grow from that. It then allows the connections to be made that the intelligence, personality and individual nature that our animal companions show, are not unique only to specific animals. There is no way I can write about everything that happened in one post, so I will write several posts over the next week. In general, being an introverted person spending 4 packed days with 1,500 people took a lot of effort. Most people are very friendly and it was great to meet some online friends in person. I learned that no matter how good your message is, presentation is so important. Our movement needs those with professionalism and positive energy. I’m going to do highlight some of my favorite speakers in the other posts. To end this overview: we are all working towards a huge, exciting revolution and social movement. The change is coming, we can see it. Don’t be afraid of a stereotype of being extreme. We are not all the same, even as we work towards the same goals. Animals have no voice. They are innocent victims to whatever human beings decide to do with them. My young daughter understood this at a very young age, and started me on a path to reevaluate my beliefs. Some people may choose to protest loudly in grocery stores, while others work on awareness and education through other channels. If everyone can do whatever they can, we will normalize this concept that animals exist on the earth alongside us, not for us. In the end, a less violent, and more compassionate world is a cause to proudly support. 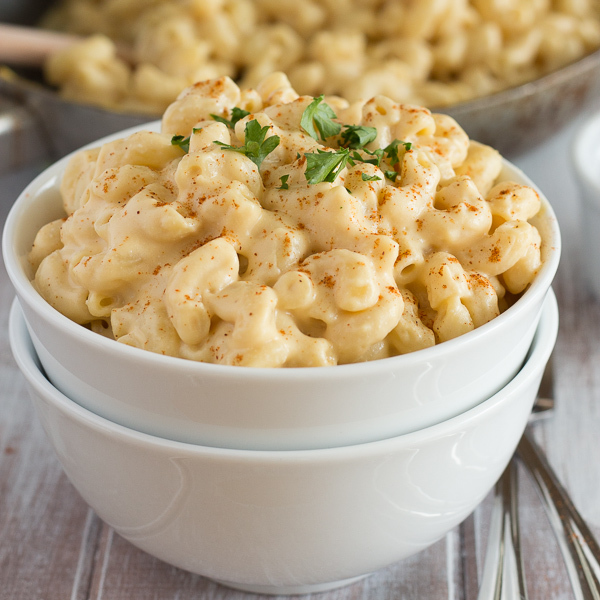 I am in love with this Cheesy Mac recipe. Not only is it creamy and delicious, it is healthy and easy! I’ve made it twice so far, and tested it on 4 unique picky kids (well 3 are really picky), and one very honest husband. It has received high marks from everyone. Bring 3 cups of water to boil in a small pot. Cook the potatoes, carrots, and onion in the boiling water for about 10 minutes, or until vegetables are tender and soft. While the vegetables are cooking, add all the other ingredients (except veg water) to a high speed blender. Add the veggies at the end when they are soft enough to blend, using a slotted spoon to remove them from cooking water. Add ¾ cup of that cooking water to your blender and blend until smooth. Cook macaroni in a large pot of boiling salted water according to package instructions (al dente). When finished, drain, and put back in the pot. Pour the cheesy blended sauce over your cooked macaroni noodles, stir, taste for salt, and serve immediately. Optionally, place macaroni mixture in a baking dish, sprinkle with bread crumbs, and bake at 350 degrees Fahrenheit for 15 minutes, or until crumbs are turning golden brown. Our local NW Veg organization is a great asset to the community. They have brought some amazing speakers to Portland, and host a very large Veg Fest every year. It was exciting to see them involved in creating this new documentary. Producers Eric Day (former President of NW Veg) and Wendy Day, Director Glenn Scott Lacey and Director of Photographer Ian Stout formed a very strong creative team for this movie. The movie follows ultrarunner Yassine Diboun as he journeys miles into the wilderness, running from a past that deeply affected his family and nearly cost him his life; and Renee King-Sonnen, who fell in love with the farmed animals on her husband’s ranch and was determined to do whatever she could to create a sanctuary; and Jerri Hastey owner of food truck Seed On The Go who wishes to share delicious eye-catching food with the masses; and young Genesis Butler who at the tender age of 3 asked her mom where her chicken nuggets came from and now she’s on a quest to protect all animals in the world. I took the kids to watch it at their opening in Portland. I thought it might be inspiring to see how even younger children can make changes in the world. I was very impressed with the quality of the film, how it was produced and edited. The stories were interesting and I liked how it could appeal to different people interested in different angles: athletes, doctors, musicians, animal lovers, foodies and more. From Ed Begley, Jr to Russell Simmons to David Carter, it was fun to see the many cameos throughout of celebrities in a wide variety of industries. I was a little confused by the lack of captions for these well-known people, but found out later that was intentional, and I believe meant to keep you focused on the aspect that these are everyday stories. At the end during the credits, everyone is credited, which was fun to see everyone who was involved. There was once scene that was really hard, and made my daughter quite emotional. Not graphically violent, but a verbal description of one woman’s experience in a slaughterhouse. The movie is available to watch for free! Watching it from a perspective of already being vegan, I would be very interested in hearing what a non-vegan thinks about it. I personally wondered if the title would narrow the appeal, but hopefully everyone can take a peek into very individual people’s lives and motivations. There is something for everyone, and they did a very professional and nice job on creating this. 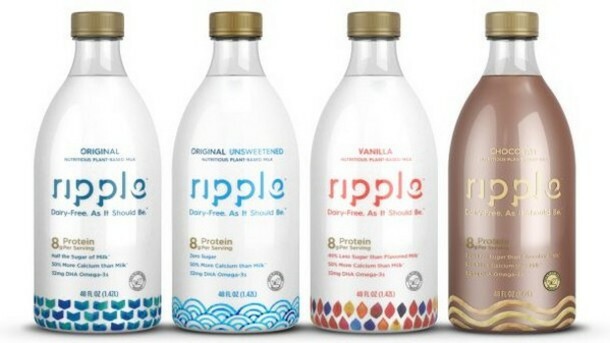 Ever since we read about Ripple Milk, we were intrigued! We sample a lot of non-dairy milk, but tend to stick to the 12 pack soy milks available from Costco just as that is easier, and we all like it. I personally find coconut milk a little slimy, and Jonathan objects to almond milk because of almond’s water intensive needs (although actually there is very little almond in store-bought milk). Hemp is my second favorite, but is too expensive. I can’t stand rice milk- way too thin, and separates out in coffee (my main use). It is okay for cereal. 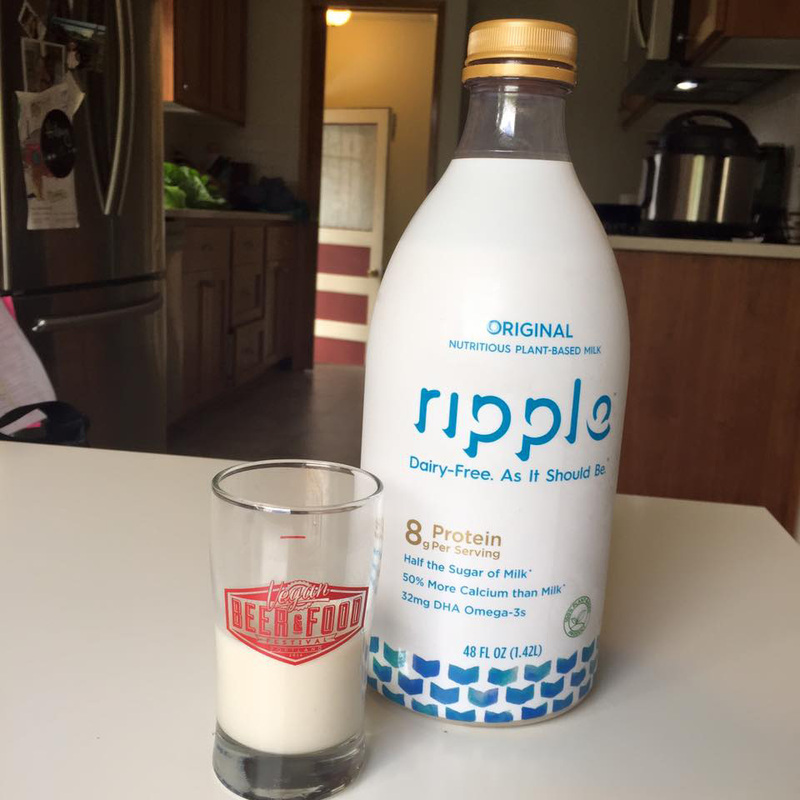 Ripple milk is made using pea protein, so it is great for those with allergies to soy, dairy and nuts. 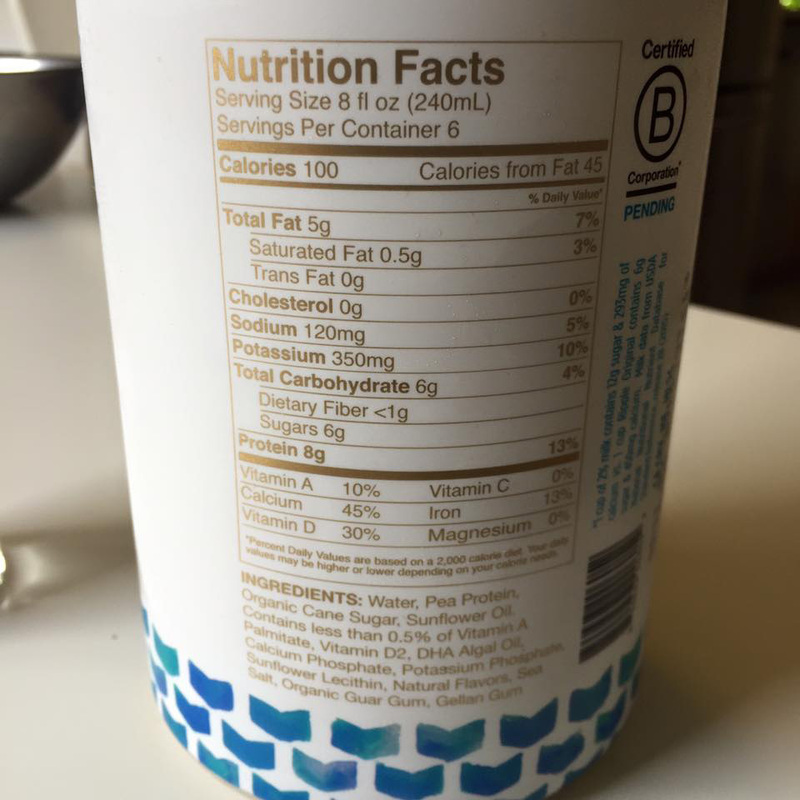 It has 20% fewer calories, less saturated fat and half the sugar of dairy. It has eight times the protein of almond milk. It also very healthy for you as it contains 32 mg of long-chain omega-3 fatty acid DHA (from microalgae), it has vitamins and minerals: 45% of the DV for calcium, 30% DV for vitamin D, and 13% for iron. I found it at Whole Foods and liked the fun packaging. It cost a bit initially more than the standard non-dairy milks at $4.99. However, you can find a coupon for $1 off which makes it more comparable. I personally liked the taste. The kids and Jonathan were not as enamored. I found that we have really stopped drinking milk on it’s own- using it only in cereal, recipes and coffee. This created a slight problem of us not really using it quickly. Because it was a little more expensive, I was saving it for drinking rather than just adding it into whatever we normally do. I think for younger kids who like to drink plain milk and people looking for a healthy milk option, it would be worth trying. Especially as it comes down in price hopefully. I will check on the Target price and see if that makes it more affordable. Although they purposefully wanted to avoid doing tetra packs, and it emulates cow milk in some regards of look and taste, I like how we can store tetra packs of milk and have them on hand.